Preheat oven to 180°C/350°F. Add sugar, honey, butter, and heavy cream to a pot and heat at low temperature for approx. 5 min., or until sugar dissolves, stirring occasionally. Let simmer for approx. another 5 min. on medium heat. Add sliced almonds and candied orange peel to the saucepan, stir to combine, and let simmer for approx. 3 – 5 min. Spread the mixture evenly on a baking sheet lined with parchment paper. Bake at 180°C/ 350°F for approx. 10 – 12 min., or until golden. Let cool for 10 min. Cut warm mass into approx. 6x6-cm/ 2.5x2.5- in. squares, then halve the squares diagonally. Alternatively break into desired size. For round Florentines, cut out with a round cookie cutter. Allow to cool completely. Roughly chop chocolate, add to a heatproof bowl, and place on top of a pot filled with simmering water to make a double boiler. Stir gently until melted. 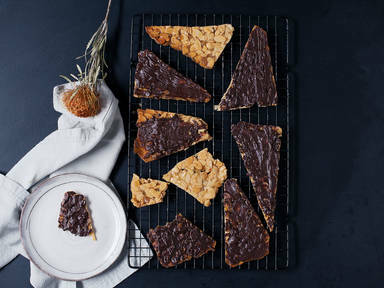 Brush the backs of the triangles with the melted chocolate. Let dry and enjoy!